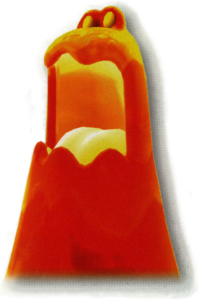 Magmaws are a smaller kind of Magmaarghs that first appeared in Super Mario Galaxy 2. In Super Mario Galaxy 2, they are only found in the Melty Monster Galaxy mainly in The Magnificent Magma Sea level. Magmaws live in lava and attack by opening their mouths and passing through asteroids that the player may be on. They seem to be mostly liquid because small objects such as meteors can pass through their body. Much like their larger counterparts, Magmaarghs, they cannot be defeated. Magmaws make an appearance in New Super Mario Bros. U in Princess Peach's Castle. They appear in Magma-River Cruise where they come up from the lava, move towards the player and go back down. Magmaws return in New Super Luigi U where they appear in the levels Magmaw River Cruise and The Final Battle acting the same way as in New Super Mario Bros. U. Magmaws, Cheep Chomps and Magmaarghs are the only enemies who can defeat Nabbit. From Ūgan, Magmaargh's Japanese name, and ｢-ちゃん」 Chan, a Japanese honorific for children or small, cute things. In the files for Super Mario Galaxy 2, they are known as "Slim Unbaba," after the Japanese name for Blargg. However, in New Super Mario Bros. U, the filename is changed to "Woochan," a romanization of its Japanese name. ↑ Super Mario Galaxy 2 Official Prima Games eGuide, page 28. ↑ Shogakukan. 2015. Super Mario Bros. Hyakka: Nintendo Kōshiki Guidebook, pages 159 and 209. This page was last edited on February 17, 2019, at 11:37.